Our submarine guide Dan explains that colors begin to fade the deeper we go into the ocean. “The vibrant colors you see in photographs of the underwater world are the result of using artificial light,” Dan says. 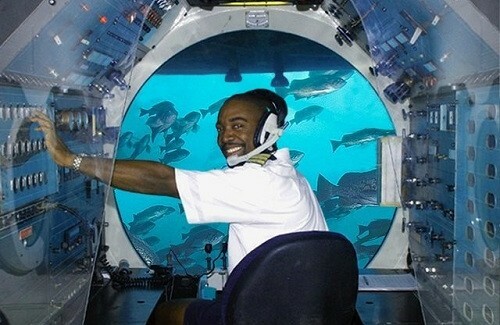 The Atlantis Submarine tours are a popular adventure when cruise ships visit the Cayman Islands. For the 90-minute submarine trip, we caught a boat shuttle from our cruise ship to the Cayman shore. There we boarded an open boat out to the 48-passenger, air-conditioned submarine. Everyone is guaranteed a seat in front of huge viewing windows on the 65-foot-long sub as it slowly descends to 100 feet. Massive barrel sponges and star corals abound on the Grand Cayman reef. Snappers, groupers, turtles, other fish I couldn’t identify and even a barracuda circled around the submarine. Grand Cayman is a great Western Caribbean destination. Start planning your next Caribbean cruise today! Click here to get started!